There’s an art to bringing baby to the bar. We’ll show you how it’s done. So you had a baby, but you’re not ready for mom bobs and minivans, and you’re definitely not ready to give up your favorite watering hole. But is it cool to bring baby to the bar? Yes! But with some guidelines. First, consider the age of your baby. An infant snoozing in his car seat is far more discreet than a 10-month-old throwing Cheerios on the floor. Also, pick the right place. Breweries and casual bar/restaurants are generally baby-friendly, even if your baby is walking. 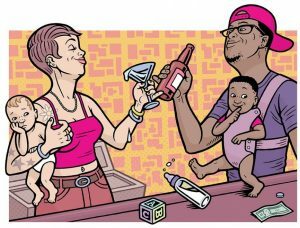 But if the bar serves an $18 martini, charges a cover, has a bouncer at the door, or has a group of early twentysomethings grinding to Drake in the corner—it’s not the right place for your baby at any age. Next, pick the right time. Aim for afternoon or early evening, before the after-dinner bar crowd comes out. Think back to your pre-baby bar-hopping days. Did you want to nurse your IPA next to a baby nursing a bottle? Lastly, consider how baby is carried. Wraps and infant carriers can be very tactful, but infant car seats are acceptable, too. (Just keep it on the ground, not on the table, OK?) Whatever you do, don’t bring the whole freaking stroller. You’ll look like a circus act and take up valuable patron space. Above all, use common social awareness skills to be considerate of your fellow bar-goers. If your mama gut tells you your baby is out of place, he probably is.